Connection information does not change in SQL Server Management Studio for SQL Server 2008 r2 when a new Query is created from Dedicated Administrator Connection. 1. Open SQL Server management studio and connect to SQL Server in Dedicated Administrator Connection. 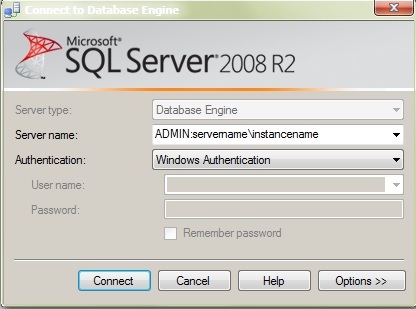 In order to connect to SQL Server in Dedicated Administrator Connection (DAC) you have to add ADMIN: before the SERVER\INSTANCE name. 2. After connecting the the Server with DAC click on new query. 3. You will get the error that you cannot connect as you are already connected to the server with DAC and only one DAC Connection is allowed. 4. Now in the error message popup click OK and change the connection to any other SQL Server. 5. Now you will find that the connection details displayed when you keep the mouse pointer over the SQL Server Query are still showing that of the DAC.